Stop arguing with your child about what’s for dinner and start dishing out the healthy foods they love! 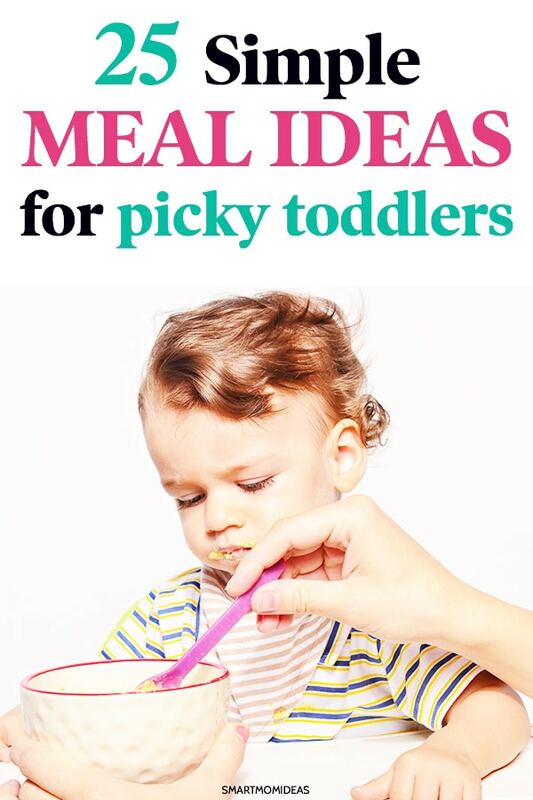 Here are toddler meal ideas they’ll love. Tired of begging your child to eat the foods you cook for them? Tired of lecturing your little one about making healthy eating choices? I’ve been there and done that. Believe me! It sure isn’t an easy thing. Cooking meals (only to throw them in the trash) is more than frustrating. It equates to throwing your hard earned money in the trash! And c’mon, the airplane food shuttle landing in your toddler’s mouth approach is so outdated. Cute thought, but I have yet to see it actually work with any child. 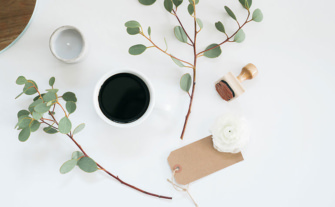 And while my children aren’t too fussy with toddler snacks, when it comes to thinking of a meal plan for dinner, ideas just aren’t flowing for me. 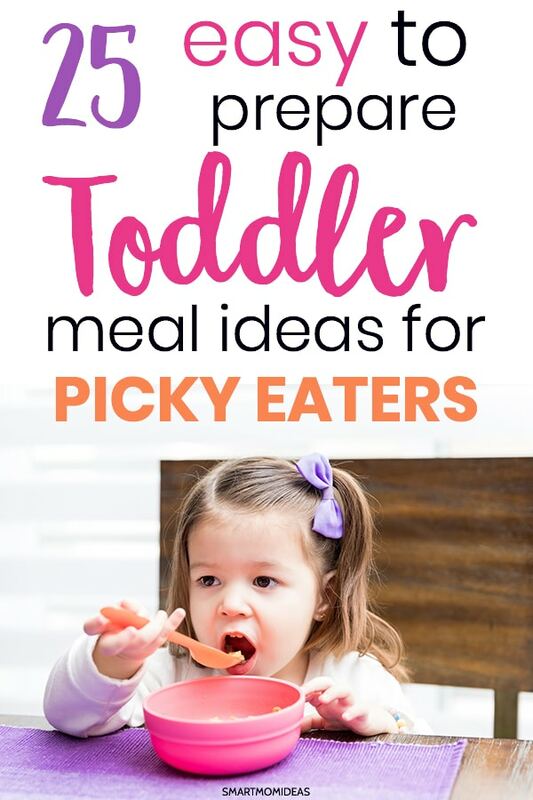 Here are 25 toddler meal ideas that will help you if you’re all out of ideas and no longer want to beg. Almond butter and banana is a great combination on toast. Start the day off with a fun breakfast meal that toddlers enjoy. This recipe takes the lead in giving your child both protein and unsaturated fat (good fat!). Keep in mind, this is a versatile recipe. Feel free to substitute the beans or veggies for any other food your child may prefer. Kids love just about anything they can dip in ketchup. If your toddler loves the chicken nuggets from the fast food restaurants, try making homemade chicken nuggets. They will definitely be the healthier option and just what you need to get your kid hooked on good food. Some kids just don’t like mushrooms because of the taste and texture. If your child squeals at the sight if them, just substitute for their favorite vegetable. My twins don’t mind if I mash up carrots and zucchini in my spaghetti sauce. Sweet potatoes are a high fiber food that contains iron, calcium and are a good source for vitamin B. Cut up your sweet potato into tiny cubes to cook faster. I love breakfast for dinner. Why not make some waffles and have a fruit bar for your child to pick and choose from. And you can even add some fun toppings like chocolate chips and marshmallows. Hash browns are a fun favorite in my household. A quick hack to make a version of these is to use day old mashed potatoes. Just squish them and flatten them in the fry pan, sprinkle some seasoning and let it sizzle. Sometimes finger food is the best types of food for picky eaters. This is a pretty versatile meal option, and there is no right or wrong way to make it. You can fill the tacos with just the chicken or you can fill it with chicken and a variety of other fillings. Try quinoa, couscous, rice, avocados, raisins, cheese, lettuce, beans, tomato, sour cream, ect. Note: asking your child which fillings they would like might be the best way to get them to eat it. They’ll feel a little more in control and will probably fuss less. Asking versus telling them what they are going to eat can make a huge difference. Breaded meats are yet another thing children seems to like. There’s just something about it. If your child doesn’t care for quinoa, try offering rice or couscous. This is more of a snack idea. But if your child likes it, give it a try! It’s a great way to get nutrients into your child if they don’t like to eat large portions of food in one sitting. The best thing about eating yogurt is that you can pile on the fruit toppings and it’ll still taste like dessert! Kids are color oriented so, yes, appearance makes a huge difference. Not just with yogurt and fruit, but with any meal you serve your toddler. Pay close attention to what your child picks over. Rather than get frustrated, think of it as a learning experience. My twins love chickpeas. I can practically add chickpeas to any meal and they will devour it up. And it’s the same with humus. Here’s a quick 5-minute humus recipe that you can quickly make when your toddler is feeling a bit finicky. You want to avoid the whole grain cereals that are loaded with sugar, mama. I would suggest you choose from brands like Nature’s Path, Ezekiel, or Cascadian Farm. There are more brands to choose from. Just be mindful to steer clear of cereals that are too high in sugar and contain excessive amounts of food coloring. Toss in a little fruit on the side as well to make it even healthier and more filling. A fun vegetarian meal to incorporate in your weekly meal plan is couscous with peas. You can even add other vegetables like cherry tomatoes, cucumbers, shredded carrot and lemon zest. Who doesn’t like macaroni and cheese? Here is a simple and kid-friendly macaroni and cheese recipe that you can use any day of the week. If there’s one way I’d recommend to get your picky toddler to eat, it would be to make smoothies packed with lots if nutrients! The awesome thing is that you can hide just about any fruit or veggie in there without a high chance of your child finding out. While your child is likely to have his or her favorite fruits and veggies, it is vital that you help your child to consume a wide variety of the right ones (and enough of them!). Smoothies are a great way to feel full as well. This recipe is extremely easy to make! It’s filled with protein and other yumminess. I love pickles with grilled cheese. But, my twins aren’t the hugest fans with dill pickles. So, I tried gherkin pickles and they love ’em. My twins love peanut butter and banana sandwiches and it’s often a meal at least twice a week! Sure, the combination most likely is not what you’d choose to eat yourself. But hey, it does read toddler all over it. The mini pizza rolls are fun and bite sized. Finger foods are usually more appetizing that larger portions, mama. So keep them small. This recipe is great for vegans, vegetarians, and meat eaters alike. It’s a breakfast food your toddler can eat at any time of the day! It contains, fruit ,flax seeds, walnuts, and cacao nibs all topped with almond milk. What a great way to add some creativity to your breakfast mix! Who doesn’t love pizza? Making it from scratch is pretty simple. You’ll need only a few ingredients: whole grain pita bread, tomato sauce, cheese and pinto or black beans. Does your kiddo want more toppings? Just add them! Try some new ways to present waffles to your picky toddler. This toddler meal idea might be the winner in your house! Working from a recipe book can save you the time you’d otherwise spend browsing page after page on the internet looking for ideas on what your child might eat. Here are some cookbooks designed to simplify your meal planning and make the process a success! This is a great this book! Do you dread meal times because you already know your picky eater is going to test your limits and try to turn the evening upside down? Welcome to the club! Jessica Seinfeld is here to make your life easier when it comes to feeding your little one at every single meal. Learn new recipes you can feed your child. They won’t know you’ve sneakily added their health fixes in there because it’s going to taste that good. Try out these recipes that should have your kiddo asking for second helpings! Enjoy 135 quick and healthy recipes your toddler will enjoy! Stop giving in to the edible junk your child is requesting. Stop with the begging and vain threats, mama! Invite peace and joy to the dinner table by trying out these recipes for your toddler. Make it fun! Pretend like your house is a restaurant. Make a menu of healthy meals they like (with a few new things) and have the pictures so they can choose. Adjust your seasoning levels. Season foods to be flavorful (or in some cases, more bland). Every child is different so find out what your toddler likes. Mix random foods they like, even if they seem like odd combos. As long as they’re getting enough of the right vitamins and nutrients. Lead by example. Your child seeing you make healthy eating choices (yes, even as a toddler) could have a greater impact on their decisions to eat healthy than your choosing to lecture them on the topic of healthy eating. Let your child help prepare their meal. Young or old, we all feel more connected to our food when we prepare it ourselves. Even if it’s just washing fruit or putting the food on the plate, encourage your child to participate! There you have it mama! May your days in the kitchen be far less stressful. Now you have 25 toddler meal ideas in your arsenal for the days ahead. A challenge it is when you have to beg your child to eat what you cook. Try some of the meal ideas above and start exploring the types of foods your child will eat. Don’t worry mama. Toddler pickiness is normal and you can be pretty confident that your little one will grow out of it. Now it’s your turn. 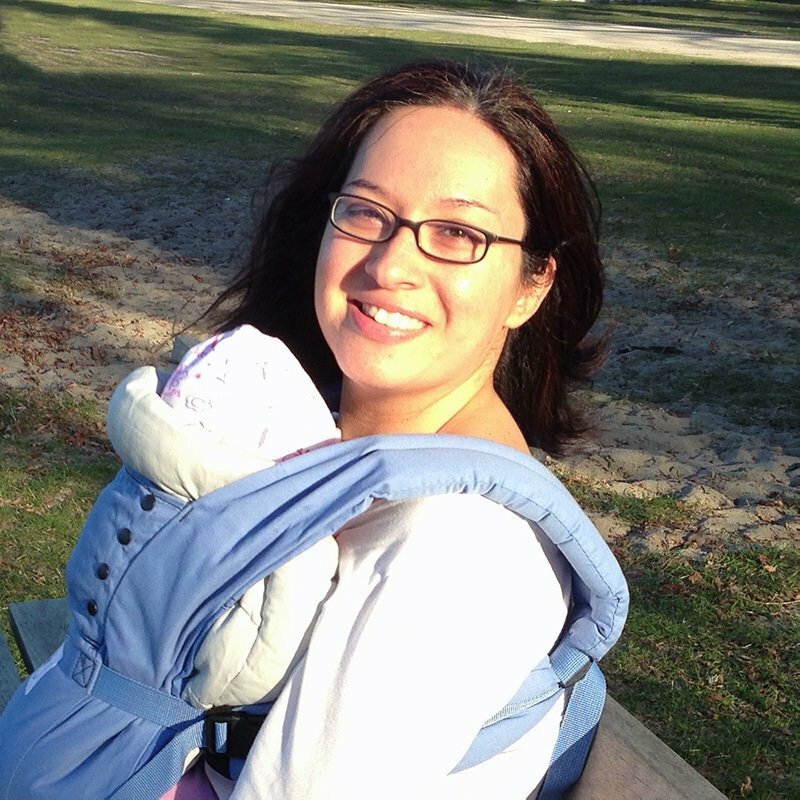 Let me know your go-to meals that your toddler loves (especially for your picky eaters). Share in the comments below.